Focussing more on the energetic side of the martial arts, the internal arts were purportedly birthed on by Taoist monks on China's sacred mountains. The three main arts are Tai Chi Chuan, soft but powerful like the waves on the sea, Ba Gua Chuan, spiraling like like a whirlwind, and Hsing Yi, which rolls over it's enemies like a giant stone boulder. As well as these three main boxing systems are the 'hybrid' arts, which combine the control of 'qi', the vital life source of the body and the use of muscular power. The Chinese internal/external arts include Southern Mantis, Pak Mei (white eyebrow) and, of course, White Crane. Puportedly invented by a young girl after praying to the spirit of a white crane to guide her boxing – that girl's name was Fang Chi. A White Crane master in a 'piercing' posture. The most famous of the internal martial arts, it is represented in the story by Mu the Nanny. Famous for its 'five element fists', Hsing Yi is represented in the story by Wang the Guardian of the Watchtower. 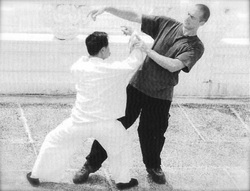 Wang Shu Jin showing Hsing Yi's primary defensive posture. Wang the Guardian of the Watchtower in the same posture. Also known as 'the art of change', Ba Gua is represented in the story by Chi's teacher Sun the Immortal. Famous for its spiraling practice of 'walking the circle', Ba Gua's exercise is demonstrated here by Master He of Taiwan.